vzrestore from a .tar with both source and destination on the same raid1 device whilst there is a simultaneous 'lighter' write operation. PS: If you end up here and have any more information about this I would love to hear from you. I wasn't clever enough to think of these myself, this is just a list of things that other folk with similar errors said worked for them. Disable write cache /sbin/hdparm -W0 /dev/sdX - helped ?maybe?, but still not perfect. With everything on the root volume i thought perhaps the snapshot was an issue, there seemed to be some notion that snapshotting the system volume was the issue. I repartitioned and mounted the VPS images on a seperate LV. Situation improved, but still not perfect. 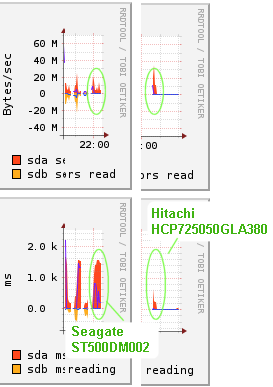 libata.force=1.5Gbps seems to have worked, but I don't really know why. The more I look the less consensus there seems to be, but for me this worked - I'm now 2 days in, 2 raid rebuilds and 12 LVM snapshotted backups (during the [forced] rebuilds) - not one hint of a problem. I've noticed this thread http://www.msfn.org/board/topic/128092-seagate-barracuda-720011-troubles/ that could be a clue, but I don't think my drives are affected. I have just replaced one of them (about the same time as forcing 1.5Gbps) with an Hitachi but the other is still in there. OK, It's (d) NONE OF THE ABOVE. All they were doing were avoiding the load that caused the first error. A certain operation yields this graph. The Seagates clearly keep the CPU's waiting for over 2 seconds for IO to return where as the Hitachi doesn't. This results in a "task blocked for more than 120 seconds" message and invariably the system hangs up for a few seconds. Replacing the Seagate drives looks to be the real solution. They seem to respond badly to heavy random IO, but were faster for vaugely sequential IO - still the failure mode was horrendous and I believe due to over optimisation within the firmware. After replacing these with either Hitachi or Western Digital drives the restore completes in 5 minutes with no hangs or other messages in /var/log/syslog. Jan 13 14:23:16 cis01 kernel: md/raid1:md0: Disk failure on sda1, disabling device. Jan 13 14:23:16 cis01 kernel: md/raid1:md0: Operation continuing on 1 devices. kjournald could be anything - this was just one example. Jan 14 15:18:21 cis01 kernel: INFO: task kjournald:2285 blocked for more than 120 seconds. Jan 14 15:18:21 cis01 kernel: "echo 0 > /proc/sys/kernel/hung_task_timeout_secs" disables this message. THESE ARE THE "FAULTY" DRIVES THAT FAIL UNDER HEAVY RANDOM IO. Needless to say they are no longer in the system.